A recent news article suggested that rising homeownership rates, particularly among Millennials, are placing strain on the future of the rental market. As always, I wanted to take the opportunity to evaluate this article through the lens of a C class real estate investor. On today’s show, I’ll talk about what this economic shift means for rental real estate investors. I’ll discuss the differences in neighborhood classifications, job contraction, and the continuous demand in C class neighborhoods. Don’t miss episode 237 of Investing in Real Estate! Most news stories about the economy and housing market are aimed at homebuyers. But if you take the time to think about what these articles mean as a real estate investor, you’ll often find a different takeaway. In the Wall Street Journal article titled Home Rentals Lose Some Mojo, the author explains that because more and more Millennials are choosing to purchase their first home, demand for high priced rentals in big cities is beginning to decline. Upon first glance, you might think that this is bad news. But to me, this article simply ensures that my real estate strategy is sound. In fact, this is exactly why I don’t recommend investing in A class neighborhoods. An A class neighborhood is the first place where tenants lose their jobs in a down economy. Every shift in the economy is felt in these neighborhoods. Not to mention, an investor who owns A class properties will have more expenses. However, in C class neighborhoods, the demand for rentals (and job expansion) is ever present. C class neighborhoods are full of hardworking, blue-collar Americans who hold steady employment. 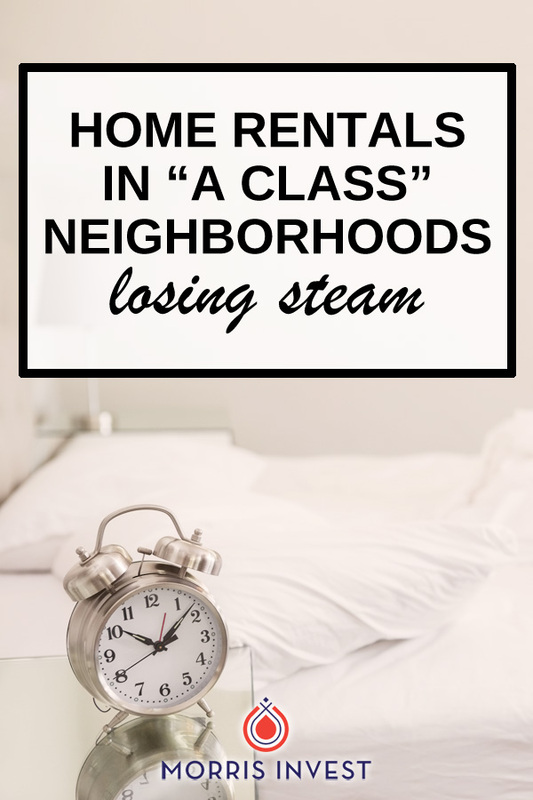 On today’s show, I’ll dive deeper into the topic of dwindling rental rates in A class neighborhoods. I’ll give the exact statistics, and discuss what’s happening with construction. I’ll also share my experience renting one of these luxury apartments. To hear about the future of the real estate market, join me on this episode of Investing in Real Estate! What industries are slowing down on hiring? How long can it take to obtain permits to build a large-scale apartment building? Exactly how much has homeownership increased? Why would an A class property have more expenses than a C class property? There’s always an influx of news regarding what’s going on in the housing market. However, if you don’t view these stories through the lens of a real estate investor, you might miss out on opportunities or neglect important information. On today’s show, I’m sharing information from a brand-new Wall Street Journal article. I’ll discuss how housing trends are reversing. I’ll discuss how these changes affect C class neighborhoods, as well as buy and hold real estate investors. Don’t miss episode 219 of Investing in Real Estate! Shortly after the housing crisis, a high percentage of renters spent more than 30% of their income on housing costs. However, it appears that that trend is reversing. This is good news for renters. This data means that incomes are rising, and also a rent correction is happening. Particularly in large metropolitan areas like New York City, San Francisco, and Chicago, rental rates are terribly inflated. I see so many apartment buildings continuing to be built in these areas. Now since builders are constructing more and more apartment buildings, supply and demand has forced prices down. But the thing is—they’re luxury apartments. They have amenities like pools and dog parks and movie theatres. Even if the prices are lower, they still aren’t affordable. There’s still a demand for affordable housing for working class people. On today’s show, I’ll explain what these changes mean for investors in B and C class neighborhoods. I’ll talk about high quality apartments in places like downtown Indianapolis, and why builders don’t work on lower cost projects. There’s a lot to consider when it comes to this topic, tune into this episode to hear more about housing demands! What percentage has the rent burden fell in households? Why is rental affordability a policy challenge? In what neighborhood classifications are apartments being built? EP048: What Are A, B, and C Neighborhoods? EP051: Why C Class Properties Are My Favorite? This episode of Investing in Real Estate is sponsored by eero. With eero, you can install an enterprise-grade WiFi system in your home in just a few minutes. For free overnight shipping on your order, visit eero.com and select overnight shipping at checkout, then enter promo code INVESTING. Due to current events and recent natural disasters, many real estate investors have been asking us about purchasing flood insurance. Here to set the record straight about flood plains, flood insurance, and how the entire system works is Karol Grove! Karol is a Certified Flood Plain Manager, a Professional Land Surveyor, and the owner of Alpine Land Surveying. On today’s show, Karol is sharing her expertise about how homeowners and investors can get a flood zone restriction removed from their property. We’ll discuss FEMA Flood Zone maps, the two routes available for removing or reducing flood insurance, and much more! Don’t miss this episode of Investing in Real Estate! Karol explains that there is a widely held misconception about flood maps. When most people discover that their home is located within a flood zone, they think that’s the absolute truth. However, it turns out that flood mapping isn’t exactly black and white. What actually makes a property in a flood zone is not a map, but the elevation on the lowest point of the structure. A flood zone map could be incorrect, and if a flood zone map says a property is in a flood zone, the lender requires flood insurance. In her work, Karol helps homeowners who are required to obtain flood insurance determine whether or not they are actually in a flood zone. Her first approach is to survey the property. Since oftentimes homes are designated in flood zones when they are actually not, Karol can survey the property and provide the homeowner with an Elevation Certificate. An Elevation Certificate that shows the property is at or above flood levels allows the homeowner to obtain a Letter of Map Amendment. This process removes the property from the flood zone, and saves the homeowner thousands per year in flood insurance. On today’s show, Karol is sharing the finer details of her process. We’ll also talk about recent flooding in Houston, how a flood claim process works, and some of the major misconceptions about flood zones. 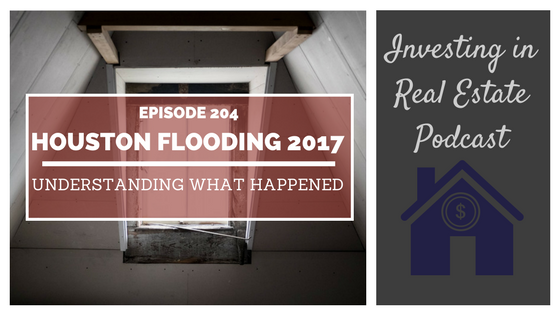 Karol is an expert on flood zones; you won’t want to miss her advice on episode 213 of Investing in Real Estate! What are the typical costs associated with obtaining an Elevation Certificate? What is a Letter of Map Amendment? How much does it cost to remove a property from a flood zone? What two federal laws are driving up flood insurance rates? In what areas can you purchase flood insurance for a home? Investing in Real Estate is sponsored by Health IQ, an insurance company that helps health conscious people get special rate life insurance. Go to healthiq.com/clayton to support the show and learn more. If you could go back in time, before the big market crash, what would you do differently? Would you change anything in your portfolio? Although no one can predict for sure what will happen in coming months and years, investors should always be prepared for the worst case scenario. Here to discuss her expertise on market trends is Kathy Fettke! Kathy is a talk show host, author, real estate investor, and co-founder of the Real Wealth Network. On today’s show, we’ll discuss the future of the real estate market, the implications of the national debt, and how investors can prepare for a potential market crash. Kathy has so much insight to share; you won’t want to miss episode 208 of Investing in Real Estate! Kathy’s entry into the world of real estate investing was accidental. She inherited a property from her father, and was introduced to the process of 1031 exchanges. At the time, she was simply trying to help her father retire and avoid a huge tax hit, but this real estate deal ended up changing the course of her future. In her broadcasting career, Kathy had a radio show in which she interviewed millionaires about passive income. In 2004, she interviewed Robert Kiyosaki. Robert informed her of his new investing strategy—purchasing properties in Texas. This piqued Kathy’s interest, so she decided to expand her portfolio. She refinanced the inherited home, and was able to purchase 12 brand new properties in Texas. The properties cash flowed for $1500 each, which was unheard of in her home state of California. Because of this experience, Kathy began helping other investors rearrange their portfolios. Kathy helped investors sell their inflated California properties and conduct a 1031 exchange before 2007. In return, the investors were typically able to purchase five to six properties in Texas, and quintuple their cash flow! Compared to that period of time, Kathy explains that the current market is similar. In fact, she advises many investors along the west coast and other inflated markets to look into 1031 exchanges. Kathy advises that it’s a good time to sell homes in bubbles for high cash flow properties. On today’s show, Kathy is sharing more insight into the future of the real estate market. We’ll talk about the government’s market manipulation, and how the Trump administration could change things. We’ll also discuss what Kathy looks for in a rental property, and how investors should prepare for the worst. Don’t miss this episode of Investing in Real Estate to learn about market preparedness for real estate investors! What kinds of assets are essentially recession proof? What are the two secrets to creating passive income? What was Kathy’s biggest real estate investing mistake? What are the benefits of a 1031 exchange? What type of property is smart to acquire within a 1031 exchange? You can't turn on the news without hearing about the death and destruction caused by Hurricane Harvey. Lately I’ve been answering emails left and right about the natural disaster. Because Houston is a popular rental market for investors, people are wondering how the hurricane will affect real estate investing. On this episode of Investing in Real Estate, I’m discussing purchasing real estate in flood zones, the purpose of natural disaster insurance, why Houston is prone to flood damage. You'll learn how Texas compares to some of my favorite rental markets, and the future of Houston for real estate investing. Don't miss episode 204! Many investors that I know love purchasing real estate in Texas. In recent years, the economy has been booming in Texas. Because there are no state income taxes, many businesses have started or moved there. Texas is also one of the most landlord-friendly states. Personally, I don’t purchase rental real estate in Texas. Because of the higher price point, as well as the higher property taxes, it just doesn’t align with my investing strategy. Not to mention, I tend to not purchase in flood zones. In comparison to Indiana, Texas is incredibly high risk for natural disasters. Meteorologically, it’s impossible for that much moisture to affect the states where I invest. Unfortunately for Houston, there’s nowhere for the excess water to go. Many homes in Houston are now destroyed from the toxin-filled water. Some homes will need to be totally gutted, while others will be leveled. On today’s show, I’ll share more about the effects of Hurricane Harvey on Texas. I’ll discuss the contractor shortage, plans for recovery and more! Please join me for episode 204 of Investing in Real Estate, and please consider donating to Red Cross for Hurricane Harvey Relief. What percentage of Houston’s real estate was affected by Hurricane Harvey? What is the National Flood Insurance Program? How does Houston’s flood protection infrastructure differ from Florida’s? How does the soil in Texas exacerbate the flooding problem? Is Your Rental Property in a Flood Zone? Should You Buy a Rental Property in a Flood Zone? Any new venture can be intimidating, and that’s often the case with real estate investing. I hear questions constantly from new or prospective investors who are worried about the risks. Sure, there are horror stories about investors who lost it all, but if you play your cards right and put a few safeguards in place, you will be very unlikely to encounter issues. On this episode of Investing in Real Estate, I’m sharing five things you can do to mitigate risk in real estate. I’ll discuss the importance of surrounding yourself with the right people, investing in the appropriate markets, and more. Don’t miss episode 162! In order to mitigate risk in real estate investing, you should know that you can’t do it alone. It’s important to build a strong team that is well versed in the areas that you are not. Without the right team in place, you’re likely to make some mistakes. It’s also incredibly important to not overspend. Don’t overspend on the purchase of the property. Don’t go overboard with upgrades either. When you pour too much into your properties, you’re decreasing your overall return. Invest in the right areas. Personally, I like to invest in C class neighborhoods. The tenants are hardworking blue-collar Americans. If your tenants are stable, you’re more likely to have consistent rental income year-round. Work with an experienced property management team. Find a company that will thoroughly assess the applicants in order to find reliable tenants. Work with a team that is local to your property and knowledgeable about the market. This will ensure great tenants and fewer vacancies. Purchase your property in landlord friendly states. If you have to go through an eviction, you’ll want to be in states where the legislation is on your side. In states that favor tenants, it can be extremely difficult to remove a tenant who isn’t paying their rent. Why is real estate less risky than investing in the stock market? How can you assemble a team to help you on your investing journey? How should you handle appliances in your rental properties? How does a property management team affect vacancies? What Are A, B, and C Neighborhoods? EP161: All About Section 8 Tenants - Interview with Al Rotiroti Sr.
One important aspect landlords should consider is whether or not they intend to rent their properties to Section 8 tenants. Unfortunately, there are a lot of myths and misconceptions out there about what it means to offer Section 8 housing. Here to clear the air about Section 8 housing is Al Rotiroti Sr. Al is a nationally recognized author and expert in the niche of government assisted Section 8 rentals. On today’s show, Al is sharing how the Section 8 approval process works, the truth behind common myths about Section 8 tenants, and much more! Don’t miss episode 161 of Investing in Real Estate! Section 8 is a government assistance program that was developed to provide quality housing for low-income individuals and families. Section 8 is qualified on a case-by-case basis. Al explains that in two identical homes that rent for $1700, one Section 8 tenant might pay $0, while another might pay $1500. As a landlord, if you choose to provide Section 8 housing, you will be held to a higher standard than the average landlord. Each year, the government will inspect your rental property to ensure it is up to standards. You will be supplied with a list of deficiencies that you will have to address in a timely manner in order to qualify as a Section 8 housing provider. Al explains that instead of viewing these extra steps as an annoyance, he embraces the extra requirements. He explains that if he were to pay an inspector to visit each of his properties on an annual basis, the cost would be enormous. But as a Section 8 housing provider, he receives free inspections, which keep his properties in a preventative maintenance situation. In terms of tenants, Al offers that Section 8 tenants are no different than any other tenant; they’re just people. The only differences are that with Section 8 tenants, the landlord has to fill out additional paperwork, and the government pays a portion of the monthly rent. On today’s show, Al is sharing even more about the world of Section 8 housing for landlords. We’ll talk about the inspection process, rent determination, and how to procure the perfect tenant. We’ll also discuss what you’ll learn in Al’s book, The Smart Section 8 Landlord! What can you expect from a Section 8 inspection? What happens to your rent if a Section 8 tenant loses their job? Why does Al say you shouldn’t consider a tenant who doesn’t have their moving papers? How can you find great Section 8 tenants? The Smart Section 8 Landlord by Al Rotiroti Sr.